At this time of year air drying your clothes after washing can be difficult – especially with the unpredictable British weather we know and love! Fortunately, there is a wide variety of indoor drying solutions at your disposal. Freestanding, wall-mounted and over-the-bath airers can all be utilised to make the most of the space available within your home to dry your clothes whenever and wherever you like. Freestanding airers are incredibly versatile, as they do not need to be permanently fixed into place they can be positioned in any room of the home and folded down for convenient storage when not in use. The Leifheit Capri laundry dryer takes up just over half a square metre of floor space but offers up to 10 metres of drying space, it is also suitably sized to stand in the bath. The Minky Trio concertina airer is simple to use, lightweight and offers an impressive 15 metres of drying space. This airer has a locking mechanism to prevent it from collapsing during use and it also includes hanger hooks for additional drying space, ideal for longer items such as shirts and trousers. The Leifheit Pegasus range of airers features several different shapes and sizes. The Pegasus 120 is a compact airer which is ideal for anyone who is particularly short of space, taking up very little floor space but providing 12 metres of drying line, it has fold-out wings which provide extra space for drying. The Pegasus airer is also available with 10, 15, 18 or 20 metres of drying space, each one increasing slightly in overall size. The Leifheit Tower range features 3 different airers which boast a large capacity for drying plenty of clothing in a small space. 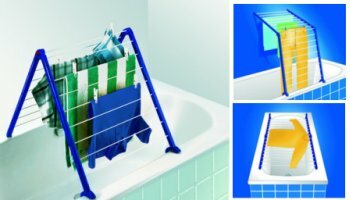 The Leifheit Tower range of airers will fit into a shower or bath and have a few different features to differentiate themselves. The Tower 190 has an extendable middle section for drying more items or longer items, the Tower 200 includes 2 hangers for larger items and innovative clips for small items such as socks or underwear, the Tower 300 has castors for simple manoeuvring and has an impressive 30 metres of drying space. Although the airers mentioned above will fit into a bathtub for convenient drying, however there are airers designed specifically for this. The Leifheit Pegasus V can be placed over the bath in 12 different positions, including from one side of the bath to the other in a V shape as the name suggests, from the side of the bath leaning against the wall or it can be folded out flat over the bath to dry larger items. The Leifheit Pegasus V Duo is the same however it can be expanded to provide between 9.6 – 18.9 metres of space. Wall-mounted airers offer a permanent drying solution which doesn’t take up floor space and will fold or retract away when not in use. The Leifheit Teleclip works on a concertina style mechanism and is available with either 4.2 or 7.4 metres of drying capacity. The Leifheit Telegant is also available in 2 sizes, either 3 or 7.2 metres of drying space, and it has two arms which fold out with strong lines running from one arm to the other. The Telegant Plus has the same features as the Telegant but also incorporates a towel rail. The Leifheit Rollfix has 5 rows of expandable line which will extend up to 4.2 metres, thereby offering 21 metres of line in total, and it features a re-tensioning mechanism to ensure the lines do not sag when loaded with laundry. GNU ceiling clothes airers cleverly combine function and style with a twist of nostalgia. These space saving clothes airers take their inspiration from a traditional design, but utilise modern manufacturing techniques to ensure a quality and durability that can’t be matched. GNU airers are fixed to the ceiling and are height adjustable via a pulley system, they feature wooden slats in a wide range of lengths which are supported by strong metal frames. All of these airers offer a simple and convenient solution for drying laundry in these cold and wet months, however there is no reason to pack them away for good during the Spring and Summer, they are perfect for use in a conservatory, utility room or even in the garden when the washing line is full! Brabantia, Capri, Concertina, Indoor Clothes Airer, Leifheit, Minky, Pegasus, Teleclip, Telefix, Telegant, Tower. Bookmark.